Who wouldn’t want to play with one of these little tykes? Hey, iOS musicians. Not just you, in fact: Hey anyone who likes fun! Meet Korg’s new music-making boxes, the Volca Drum and the Volca Modular. They’re new additions to the Volca family of paperback-size music machines that hook up together or work alone. And they work great with your iPad or Mac, if you like. Fun and intimidating at the same time — just like your first beer. The Volca Modular is a pretty advanced piece of kit. It packs several synthesizer modules inside, and you can patch them together by jacking cables into any of the 50 patch points on the unit. If you have no idea what modular synths are, then you can either buy this anyway and find out (it’s pre-wired internally so you can just get started), or check out some of the excellent iOS modular apps, like Moog’s astonishing Model 15 or Bram Bos’ Ripplemaker (which the new Korg resembles quite a bit). As you can see, it can get pretty wild. For many folks, the Volca Drum might be a better place to begin. I mean, just look at it. Just you, a drum machine, and a dark room. 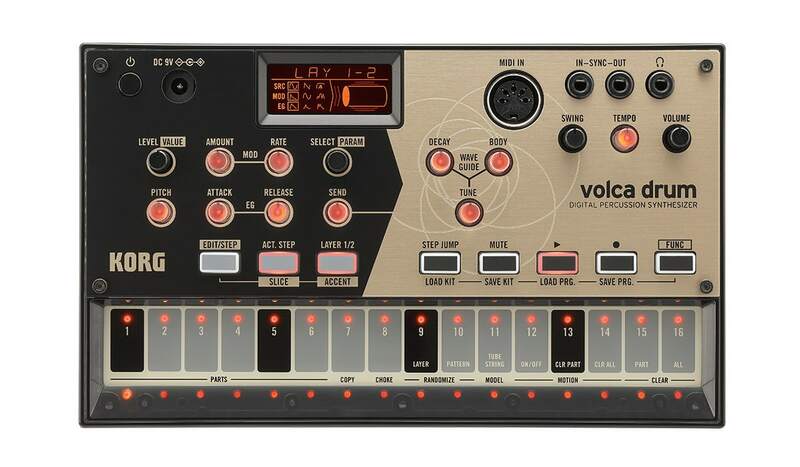 The Volca Drum uses oscillators to generate sounds, then models them into drum beats and all kinds of other noises. You can also add harmonics and distortion to sculpt the sounds further, and then go crazy sequencing your beats. The unit comes with a MIDI-in port, so you can sync it with your audio apps, then run the audio back out to be recorded. This means you can fully integrate the device into your iPad or Mac music-making setup. Prices? Very, very reasonable. The Drum comes in at the same $170 as the other Volcas. The Modular’s $200 price tag reflects the unit’s extra complexity. Available from your local music emporium.